Getting the most out of your squatting depends on your bar position. So you’re ready to get off the leg press and start squatting. Great. You’ll build muscle and real-world strength like never before. But you have to decide one thing first: how are you going to perform the lift? There are two ways: “high bar”, in which the bar rests on your traps at the base of your neck, and “low bar," where it sits further down on your rear deltoids. The one you choose depends on your body type and goals, and determines the technique you use for maximum gains. Jim Smith, C.S.C.S., strength coach and author of Strength: Barbell Training Essentials (pick it up at dieselsc.com), has an easy test to determine which squatting style is best for you. 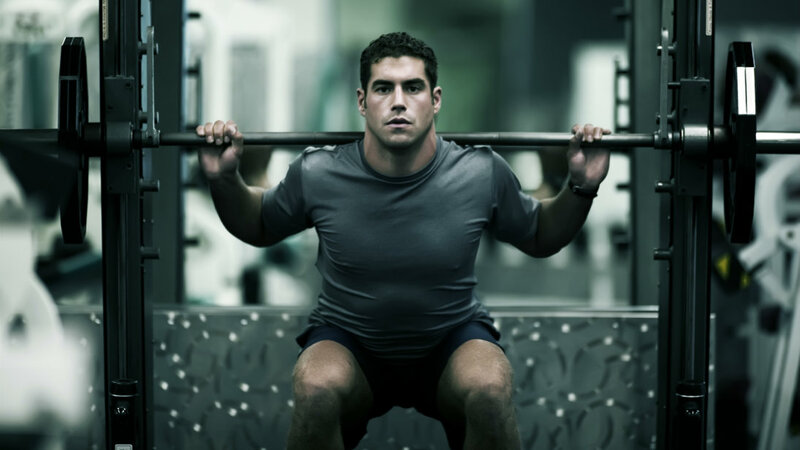 Perform a body-weight squat with feet shoulder-width apart and toes turned out a few degrees. “Do your hips immediately shoot backward while your chest falls toward the floor? Or are you able to squat down easily with your torso upright so someone could read the front of your T-shirt?” asks Smith. If you have short legs and mobile ankles, you’re probably in the latter group and, Smith says, "better-suited for high-bar squatting." If you’re lanky and find that your knees bend past your toes while your chest collapses forward, you’ll do better with a low-bar squat. It isn’t a matter of one being “better” than the other, but rather which style suits you best. The high-bar position lends itself to staying more upright when you squat, and that hits the quads harder and is more common among those who train Olympic lifts (snatches and clean and jerks). The low-bar style will have your torso bending forward more, but because the bar’s center of gravity is lower, you’ll be able to control it better and push your hips back farther while keeping your chest forward and not down—a key aspect of good form. You’ll likely also feel like using a wider stance with the low bar—slightly outside shoulder-width. Low-bar squatting hits the hamstrings and glutes better and allows you to lift heavier, so it’s more common among powerlifters. Experiment to see which bar position you like best, and feel free to mix them up as your training progresses. Doing high-bar squats with lighter weights for a few weeks can help break plateaus in your low-bar squat because it will strengthen your quads more, while switching to low-bar squatting may be appropriate if you sustain a knee injury that high-bar squatting aggravates. Use ’em both!